Renee Carlino really got me with Before We Were Strangers but she totally decimated me with Swear on This Life. This book was such a unique and novel concept, a novel within a novel. 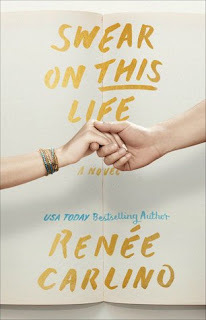 The synopsis pulled me into this one first and foremost, plus of course, it is Renee Carlino…but what was delivered was so unique, refreshing and totally unexpected. This book was seriously amazing, beautiful, poignant and so emotional. This was one of the greatest second chance romances I have had the pleasure to read and definitely the most individual. I know I have used UNIQUE a lot…but, this was just that, UNIQUE and I applaud the author for delivering something so different that even the way it was presented was a journey itself. Imagine picking up a romance book that is number one in the best seller charts, your friends are fawning over how incredible it is, how the author has such a fantastic female voice even though he was a man, how sad, intense and emotionally gripping the story was, how this poor girl went through so much and the author bared this fictional character’s soul only to start and find out it was your story. Not some story you wrote and somebody plagiarised, but your personal life story. Someone had cruelly capitalised on the pain you went through, sensationalised it, used their own creative license to redeem themselves and made a lot of money from it. Also, the painful realisation that the author could be none other than your childhood best friend and your first love, the man that left you twelve years before, with unkept promises only never to be seen or heard from again. You would be pissed!! As was our Emiline. Emiline was a writer herself and was currently teaching writing at a university. While her friends around her had moderate success, Emiline was still struggling to find her voice, and her boyfriend of seven years was her toughest critic. Emiline had always kept her past to herself, she never opened up to anyone, not even her boyfriend, Trevor. Emiline was her present and her future and what happened in her past, stayed there, never to see the light of day again, until it wasn’t. When Emiline first picks up the book All the Roads Between my heart literally crumbled, Renee Carlino really delivered on the emotional impact that this book delivered to Emiline and thus passed it onto me, the reader. As this book flip flops from the present to chapters of All the Roads Between, which is Emiline’s past, you finally begin to understand the real Emiline. Layers upon layers of seamless, perfect writing, deliver a harrowing tale within the light of a beautiful friendship. A story of two kids who made the best of what they had and cherished every moment they spent together, how a childhood friendship developed into innocent love until they were cruelly ripped apart. How despite the adversities they were presented with, they still had each other, until they didn’t. Now Emiline has two options, confront the author J Colby, or let bygones be bygones. Emiline though was stronger than she gave herself credit for and maybe just maybe this would be the closure she needed, or would it just bring up painful memories and even more damning, reawaken old feelings that she had spent over a decade damping down and trying to forget? Renee Carlino delivers an exceptional story that literally summons every single emotion with ease. You live and breathe Emiline’s story, you feel everything, you experience everything and you cannot help but be totally consumed by every little thought and every little detail. This story was captivating from first to last page, the writing was exquisite, breathtakingly real no matter the ugly but it is this that really hammers home their connection. How two kids effectively traversed a life of let downs, a life that no kid should experience, a life where one friendship was their life. Their one “person,” their one confidante, the one they could rely on no matter what. These two were connected by love, by friendship and by an invisible tether that would forever lead them back. A bond so strong that it could never be broken, just biding its time until the stars were aligned, until the invisible became visible. Swear on This Life was heart wrenching at times, but uplifting in others. It was perfectly balanced, extraordinary in its delivery and will forever be a tattoo on my heart. Pure genius!